“Media should play a vital role to highlight plight of transgender community which is incredibly diverse. Some transgender people identify as male or female, and some identify as gender queer, non-binary, a gender or somewhere else on or outside of the spectrum of what we understand gender to be. 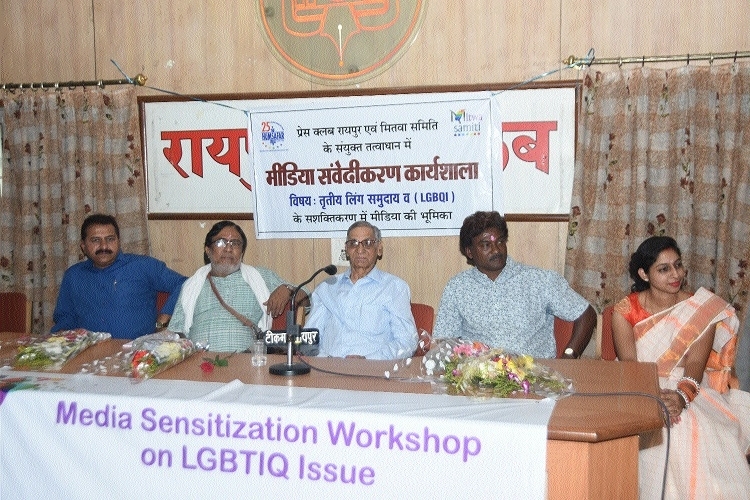 Some of us take hormones and have surgery as part of our transition, and some don’t,” said senior journalist Ramesh Nayyar during the day long workshop on ‘Media Sensitisation on LGBTIQ issue’ organsied at Raipur Press Club. The workshop was jointly organised by Chhattisgarh Mitva Sankalp Samiti, Raipur Press Club and Hamsafar Trust (New Delhi). Speaking during the workshop Ramesh Nayyar said that its time to spread awareness among the masses about community, equity for the transgender persons and betterment of their livelihood. He called on the media persons to support the cause, which will be instrumental for their empowerment in the social field. He said that the visibility of transgender people is increasing in popular culture and daily life, but they still face severe discrimination, stigma and systemic inequality. Some of the specific issues faced by the transgender community are like lack of legal protection, poverty, harassment and stigma, anti-transgender violence, barriers to healthcare and Identity documents. Noted novelist and journalist Girish Pankaj said that media role can bring certain development in transgender people by writing positive reports and promptly covering their activities. Similarly, Chhattisgarh Action and Research Team President Gautam Bandhopadhya emphasised that state government should provide transgender education facilities, employment opportunity and government services. Various topics were discussed including misconception about the Transgender and LGBT people, session for allies, history of the community in India, third gender recognition, biological difference and identification etc. The major topics which were the part of the discussion was, the scrapping of section 377 and NALSA Act. The community members, Akshay Mankar and Raveena Birha explained thoroughly about the community through presentation. Also present during the occasion were Dr Akansha Dubey (Agrasen College, Journalism Department), Vidhiya Rajput (Chhattisgarh Mitva Sankalp Samiti).